In all 31 houses were visited during the whole month of Karkatakam. On 12th August Ramayana Samarpanam two hour program was arranged. The bronze idols of the trio including Hanumanji’s, were kept on stage. The program started with parayanam of the stuthis from the Adhyatma Ramayanam like Ahalya stuti, Parshuram stuti and Kabandha Stithi. Following this was Sangeet archana by budding artists Kum. Neha Nair and her brother Siddhartha Nair, Smt. Jayashree Satheesh of Paravur, a well known vocalist and Sri. Sanjay Raj, another local vocalist. After this followed pushpaarchana with Rama and Hanuman Ashtottara chanting. At the end a talk by an Ayurvedic practitioner Dr C Padmajan, a devotee of Sri Rama. 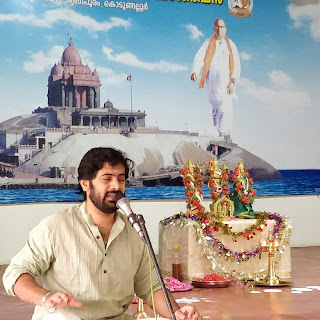 He elaborated the various characters in Ramayana and stressed on the regular study and chanting of Adhyatma Ramayana and not limit the parayanam only for the Ramayana month.